I took a look at The Daniel Plan and decided right away it wasn't a plan I could stick to. I could not eat vegetables. I had an aversion to them as long as I could remember and they made me gag. There was no way I could make half of my plate veggies. BUT, I decided to read the book with my friends, pray a lot, and see if I got any new insights. The Daniel Plan is the most inspirational book I have ever read—full of scripture. A new excitement was unveiled in me, and I wanted to start the plan. I prayed to God daily for weeks to give me a taste for vegetables. I told God that I had tried many "diets" and failed but that this was going to be different. I wanted to make this plan a way of life. I wanted to be good to my body and glorify Him. I went through the detox, not eating many vegetables, but staying away from the foods that were not allowed. The detox program allowed me to reset my taste buds, getting all the junk out of my system. Through prayer and detox, I was able to eat vegetables for the first time in my life! A miracle! I never wanted to look back. The friends who started with us slowly seemed to stop following the plan, but we decided this was working great for our family and we wanted to stick it out. My husband and I are definitely each other's strongest support systems aside from God. We push each other to wait until our designated cheat meals to have things not allowed (following the 90/10 rule). It makes those cheat meals so much more enjoyable. Faith is the biggest of the 5 Essentials for us so far. Once we had the faith that this was going to help us and this was our new way of life, everything else was easy. I had a talk with God and told Him that I had tried and failed for years and knew I could not win the battle of weight on my own. But I knew through His power, I could do anything. It has now been a year and a half into our journey of health. We have really embraced the Daniel Plan way of life. Our entire family is benefitting from the changes we have made. I now have the energy to walk/jog 5 miles every day and 10 miles on Saturdays along with several days a week of strength training. 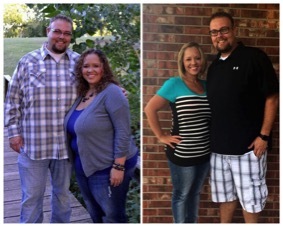 I am now down 90 pounds myself and my husband is down 65 pounds for a total of 155 pounds...and we still aren't done! We are continuing to live and love life and teaching as many as we can about the Daniel Plan way of life. I have led several connect groups and I am excited about the new 5 Essentials Series and the lives I will help to influence as I help encourage and inspire as many people as I can. I feel like health and wellness is the ministry God has called me to and I'm blessed to live it out. Don't ever count yourself out. I almost didn't even try this plan because I didn't think there was a chance I could even come close to following it. Now not only do I follow it, but it is simple and it’s something my husband and I feel like we can do for the rest of our lives. Amber Story - Daniel Plan from Saddleback Productions on Vimeo.